The Markilux 730/830 is the fully retractable drop arm window awning with gas piston-driven arms. The gas pistons are situated at the drop arm pivot point to provide smooth operation. The Markilux 730/830 range of drop arm retractable awnings are easily adjustable so the desired level of shade can be achieved. Once retracted, this awning is protected in its small, stylish cassette ready to be used again. Not only do the drop arm pivots offer smooth operation, but they also allow the awning to manoeuvre into any position upto 140º over the window to provide the perfect shade to any commercial building. The high quality pivot arms ensure the awning material remains accurately positioned with high tension to fully protect the window. The Markilux 730 & Markilux 830 drop arm awnings have a fully self-supporting cassette constructed from extruded aluminium which is only 4″ in height. It’s compact and stylish profile blends into the building so when the awning is retracted, it is almost unnoticeable. The cassette can be mounted onto a wall, roof or balcony thanks to the telescopic accro bars. The maximum size of a single awning is a width of 23ft with an 8ft drop. Each awning is constructed to purpose-made sizes to meet your needs. It is possible to couple units together thanks to an adjusting coupling flange. This drop arm awning is available as both manual or electric automation. It is operated using a winding handle when ordered as a manual, however an electronic drive with remote control is installed when ordered with an electric automation. 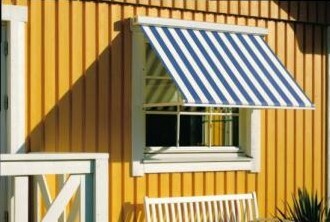 The Markilux 730 and Markilux 830 awnings are available with a range of different covers ranging from Sunsilk Self-Cleaning materials to sun-blocking Transolair materials. Click here to view the awning covers. Markilux 730 & Markilux 830 – What is the difference? There is only one small different between the Markilux 730 and the Markilux 830 and that lies with the cassette profile. The Markilux 730 has a square cassette profile whereas the Markilux 830 has a stylish rounded cassette profile.